Who can resist a beautiful children's picture book with both books AND chooks on the cover? If you love books, or know a child who does, take a look at The Children Who Loved Books. Written and illustrated by Peter Carnavas, and published by New Frontier, this is the latest children's picture book created by Carnavas. The Children Who Loved Books really is a paean of praise to reading, and to libraries everywhere. The storyline is simple: Angus and Lucy live simply in a caravan with mum, dad and a ton of books. One day the family decides to get rid of all their books. Suddenly, they find there is too much space between them all, until a library book shows them the way back to family closeness. Some of the themes in this book are quite adult. But I think The Children Who Loved Books can work on two levels. Kids will understand that a shared love for reading, or indeed any pursuit, can bring a family closer together. And parents and teachers will appreciate the opportunity this book offers to facilitate discussions with children about needs and wants, and the things that really matter in our lives. and here's a guest post by Peter Carnavas on The Book Chook. 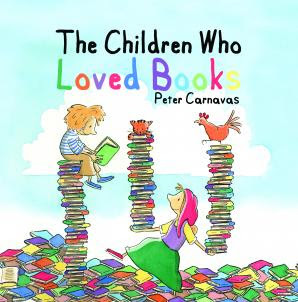 I love Peter Carnavas books. I've collected them all! @Sandy Fussell Do you have a favourite? Mine is usually the latest one! This sounds divine, and very timely. A note came home from the cherub's school this week about a book fair for school during book week- I told her to pick out some books she doesn't want anymore, and boy did she go off! @Green MamaAh yes, Mum, no such thing as a book not wanted anymore! I recently moved house, and the wrench of parting with some of my books is with me still. I am doing my very best to cure that ill by quickly gathering new ones!